Published: Nov. 9, 2012 at 06:10 p.m. 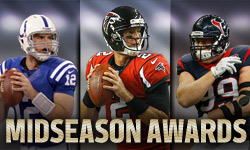 Updated: Nov. 10, 2012 at 08:44 p.m.
We tackle the biggest injury news all day on Around the League. When the final injury report comes out, we collect all the injuries -- big and small -- in America's most popular injury roundup with people that know they are going to die. 1. New England Patriots tight end Aaron Hernandez got the "limited practice, questionable" on the injury report treatment because of his ankle injury. He sat out the Patriots' last game before their bye week, but NFL.com and NFL Network's Albert Breer reports that Hernandez isn't expected to play Sunday against the Buffalo Bills. 2. It's Taiwan Jones time in Oakland. Or quarterback Carson Palmer will just throw it 70 times. Raiders running backs Darren McFadden and Mike Goodson are out with high ankle sprains. Defensive lineman Richard Seymour (knee and hamstring) is also out as the Raiders take on the Baltimore Ravens this week. 3. St. Louis Rams wide receiver Danny Amendola (shoulder) is expected to return for the Rams. He's questionable to face the San Francisco 49ers. 4. The entire 49ers roster is expected to be available for the game against the Rams. This is the second-straight year they have been remarkably injury-free as a team. 5. Jake Locker is back for the Tennessee Titans and will start against the Miami Dolphins on the road. Don't discount the impact of his return; he was electric in his last complete game for the Titans. 6. Running back Darren Sproles (hand) is out again for the New Orleans Saints. Look for more Chris Ivory and Mark Ingram playing behind Pierre Thomas when the Saints march into Atlanta. 7. The Minnesota Vikings are calling wide receiver Percy Harvin (ankle) a game-time decision, but he's listed as doubtful. He reportedly will not play, and it would be a big surprise if he faced the Detroit Lions. 8. Lions wide receiver Calvin Johnson (questionable, knee) returned to practice on Friday. He should be ready to roll for Sunday's game against the Vikings. And he probably will stop talking about injuries after more drama on Friday. Safeties Louis Delmas (knee) and Amari Spievey (concussion) remain out. 9. Plenty of drama over New York Giants wide receiver Hakeem Nicks' knee injury, but he's probable. Running back Ahmad Bradshaw remains questionable, but almost certain to play against the Cinncinati Bengals with his foot injury. Safety Kenny Phillips remains out with his knee injury. 10. Seattle Seahawks wide receiver Braylon Edwards facing off against the New York Jets has been overlooked on reunion weekend. He is probable with his knee injury. Seahawks guard James Carpenter and linebacker K.J. Wright both remain out with concussions. 11. The San Diego Chargers could be without three key starters against the Tampa Bay Buccaneers: tackle Jared Gaither (groin, questionable), defensive end Corey Liuget (hamstring, questionable) and pass rusher Antwan Barnes (hamstring, doubtful) all didn't practice on Friday. 12. Chicago Bears rookie wide receiver Alshon Jeffrey returned to practice on Friday, but he's doubtful to play against the Houston Texans because of his hand injury. 13. Fantasy football worry: Texans tight end Owen Daniels didn't practice until Friday this week, and was only limited then. He's questionable. Defensive tackle Shaun Cody and running back Ben Tate are out for the big game at Soldier Field. 14. Dallas Cowboys running back DeMarco Murray (foot) is out again and will not take the field against the Philadelphia Eagles. Cornerback Mike Jenkins (back) is questionable after missing practice completely Thursday and Friday. 15. Out for the Buffalo Bills: defensive end Mark Anderson (knee), cornerback Terrence McGee (knee), tackle Erik Pears (hip) and Aaron Williams (knee). Wide receiver Steve Johnson (thigh) is listed as questionable, but says he'll play against the Patriots. 16. Atlanta Falcons linebacker Sean Weatherspoon (ankle) is out once again as the undefeated Falcons fly to New Orleans. 17. Denver Broncos guard Chris Kuper (ankle) and cornerback Tracy Porter (illness) both remain out as the Broncos hit the road to face the Carolina Panthers. 18. Ravens defensive tackle Haloti Ngata (shoulder) is listed as questionable, but is expected to play against the Raiders after practicing on a limited basis Thursday and Friday.